We finally finished our work at the mooring site yesterday evening. The marine snowcatcher work was not terribly successful. We are having difficulty in keeping them sealed, and also with the brass “messenger” that slides down the wire to trigger the catcher to shut. However, as usually happens, the Marine Facilities engineers on board have some ideas that might solve our problems so we’ll get another try in a couple of days. We are heading southwest now, making a series of measurements with the CTDs across the continental shelf and to the shelf edge. There was some nasty weather during the night, with winds over 50 knots – dropped to 15 knots or so today, but it has left a decent swell for us to ride over on our way out. Over the next day the depth will increase slowly from 150 metres to 200 metres, then within about 2 hours the seabed will drop down to about 3000 m as we leave the continental shelf and head briefly into the open ocean. We will be doing a lot of iron chemistry out there, but I’ll explain more on what that is all about once we get started. For now, work in the labs continues, on the samples we have collected since Monday and on those we collect during today. 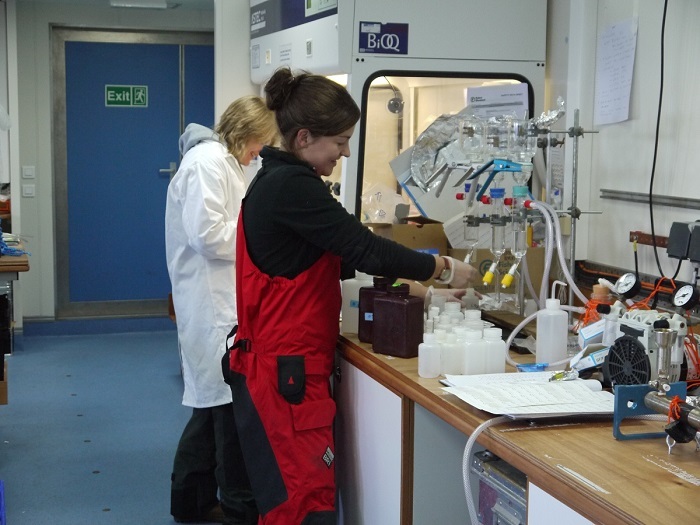 Invariably the lab work involved filtering lots of seawater, either because we want to analyse the pure seawater without any organisms in it (e.g. for dissolved nutrients), or because we want to filter out the organisms to study them more closely.